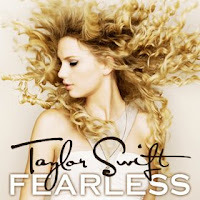 Taylor Swift's Fearless topped the charts for another week, but once again the sales fell, this time to a mere 63,000 copies (about 11% from last week). It used to be that a 56k weekly sales amount might get you dropped from the label, now it's a #1. Beyonce was second with only 40,000 units sold. Overall, sales for last week were down 15.4% versus the same week a year ago, to about 5.89 million units total. All that being said, part of the reason for the drop in sales is that it's really hard to find a place that even sells CDs any more. With Circuit City going out of business, this will get even tougher in the future. There seems to be a niche available for a new CD/music retailer out there, but the economic climate is not the best for a new business launch seen as dubious by some. Even so, you can't buy it if you can't find it! 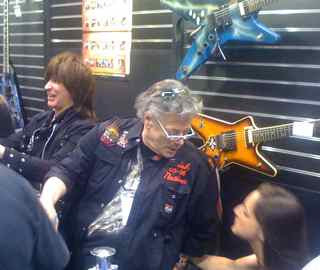 How Big Was NAMM 2009? If you ever wondered just how large NAMM really is, this video will give you an idea. 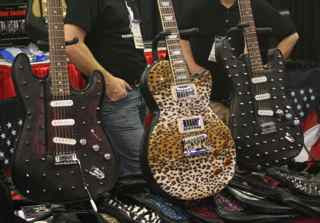 It's a quick look at just some of the guitar, bass, drum and amplifier manufacturers. I challenge anyone to actually spend time with them all! 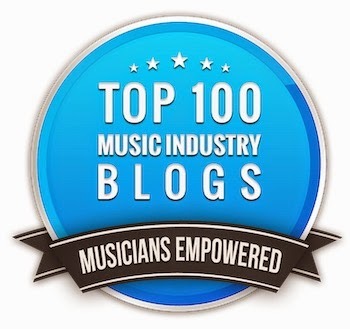 Heard this from an astute observer, investor and player in the music business yesterday - we might be missing a major label soon as the odds are getting longer and longer that the fabled Warner Music will make it. With their market share dropping, their debt increasing, and stock down to about $2, it seems like it's only a matter of time until the company is merged or goes away completely. Once upon a time (like before 2000) this would be an unthinkable option regardless how bad things were, since catalog and publishing income would still continue to chug along even without any big hits. But catalog sales were the first thing hit by digital music, publishing income is down in all forms (even sync fees, which were strong until lately), and the chances of a new company-saving blockbuster hit is as remote as a hotdog on a tropical island. To most people in the new music biz (except Warner stockholders), the demise of Warners would hardly cause a ripple in the day to day stream of business. In fact, some feel that the sooner the old, tired, dead wood of the industry is cleaned out, the sooner we can find a new business model for the industry that brings a modicum of health back and settles the distribution turmoil. So start the watch now. It might not be this week or next week, but the prediction here is that we'll have one less major label by the end of the year. 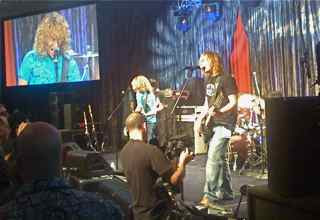 Every wondered what NAMM is like? Well if you've never been there, this video will give you a brief taste of the many wonders of the most beloved music trade show on the planet. 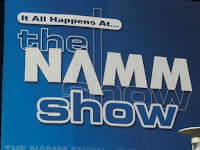 Next post - Just how big NAMM really is. What I love best about NAMM is the oddities - the products that have a low chance of widespread acceptance that clearly scratch the itch of their creators but no so much the public at large. There's always something that you haven't seen before or something with a new twist, even if it's not too practical. Here are a few things that I saw. 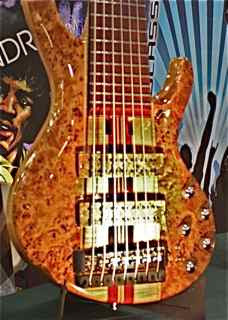 The 7 string bass. When 4 strings, eh...5 strings, eh...6 strings aren't enough, there's always room for one more. I bet you won't see this on a Motown session any time soon. 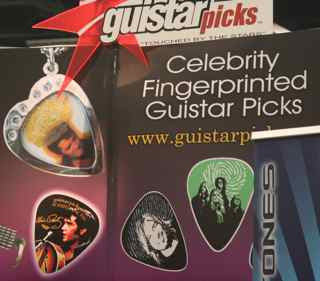 The next best thing to having your favorite star with you is having their fingerprint on one of your picks. Does talent transfer through a fingerprint? One of the many booths with cheap knock-off products from China (in this case) or Korea. Who buys this stuff, anyway? Don't like the look of your guitar? Change it with a jacket. After all, it's the easiest way to get that studded look that you always wanted. The world is saved! 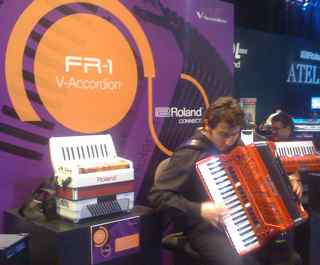 We now have a virtual accordion for all those digital polka gigs!! A lesson in branding (not). 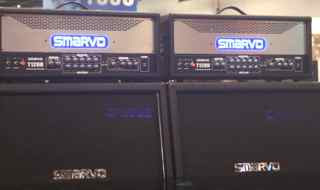 "I'm gonna blow you away with my Smarvo stacks!" Oh, you mean the radio has to go inside the car. Now I get it. Now for something serious. 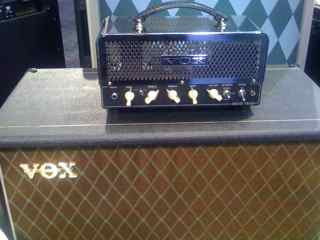 I actually did like this Vox Night Train amp a lot. 15 watts, EL84 tubes (like an AC-15 or 30), compact - what else could you want? 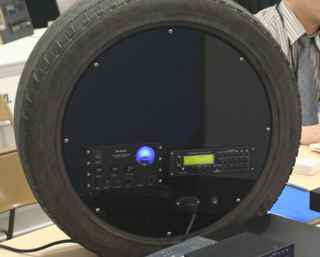 The annual National Association of Musical Manufacturer's (NAMM) trade show in Anaheim last week was the anti-CES. It was almost like there was no recession/depression, credit was easy to get, and everyone had more money than they knew what to do with again. Indeed, the mood was very upbeat with lots of energy, and the crowds were at least the same amount as last year and perhaps a bit more. As opposed to CES, there were very few booth cancellations and in general, everyone seemed in good spirits and oblivious to the economy. In fact, I actually came down an extra day just to soak up the positive vibes, since it's so rare these days. 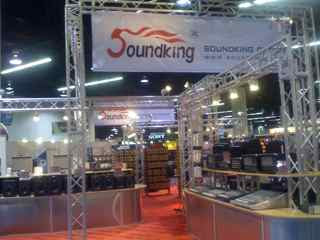 A little overview for those of you who've never been to NAMM. 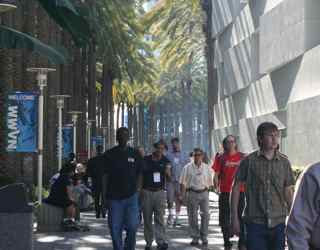 It covers the entire Anaheim Convention Center as well as a few of the surrounding hotels. Hall A contains mostly audio and music software, Hall B has many of the larger manufacturers and distributors like Peavey, Kaman, and Ibanez as well as most modern instruments and accessories, Hall C contains traditional band instruments, Hall D is mostly percussion and Hall E in the basement contains the newer NAMM members, which are mostly the smaller Mom & Pop manufacturers. The concert hall connected to the convention center is dedicated to DJ and stage lighting. But there's more. Floor 2 contains a variety of instrument manufacturers but centers on pianos, and Floor 3 is taken mostly by Fender and Gibson. The convention center of the adjacent Marriott is occupied by Yamaha, and many of the rooms in the Hilton have private invitation-only demo rooms. It's a big show. Not CES big, but large enough that you can't see it all properly in a day. This year you needed a picture ID along with your badge to enter the show in an effort to deter the badge lending that's been so blatant in previous years. As a result we saw some long lines at each entry point, but no one complained. At least it kept the kids out. There were lots of other security as well, like random ultra-violet checks to authenticate badges, a bomb-sniffing dog, and even some undercover cops, which seemed odd for a show of this nature. 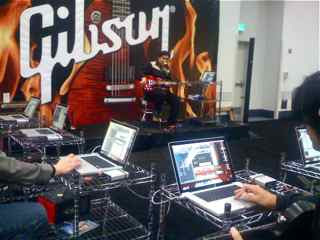 The Gibson booth was open to the public this year after 2 or 3 years of dealer-only policy. I'm told that one of the highlights of the show was a mini-concert with Brian Wilson at the booth on Thursday, which unfortunately I missed. DJ's were ever-present again. Last year the trend seem to wane, but DJ gear was back with a vengeance at this show. There were actually more booth-babes at CES, believe it or not. 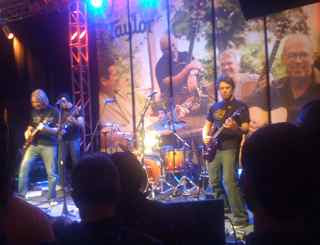 Usually CES is very staid and professional and NAMM is very Rock & Rock. NAMM is still pretty R&R with a lot of groupie-style young ladies around the various booths, but CES had NAMM beat for total amount of cleavage this year. There seemed to be more booth shows than usual this year, with a lot more of them featuring full production. As usual, there were no products that set the show buzzing, just the usual evolution and upgrades. Why can't anyone make something new for a change? Along that line of thinking and just like CES, products are either getting a lot smaller or a lot larger. I guess the middle ground is already saturated. I heard some pretty crappy audio again from so-called audio manufacturers. One trend I did see was that every SR manufacturer had small line-array models available for small venues, which is a great trend. Inventors-Row in the basement is still the most fascinating area of the show. We won't see most of these exhibitors next year, but at least there are people taking chances on their ideas. I'm going to dedicate an entire post to what I saw down in Hall E, because it always seems to get overlooked. Manufacturers were indeed booking orders, by all accounts, a good sign for the industry. The MI industry hasn't quite felt things like the rest of the country, at least not yet. But by the looks of the show, perhaps they'll dodge a bullet. I shot lots of video, so Parts 2 and 3 will include lots of moving pictures.